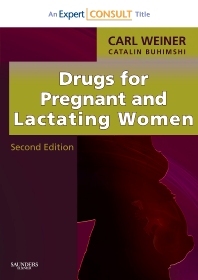 Drugs for Pregnant and Lactating Women, 2nd Edition, by Carl P. Weiner, MD, MBA, FACOG, and Catalin Buhimschi, MD, is a must-have reference that details how virtually all of today’s drugs and herbal supplements interact with pregnancy and lactation. Updated thoroughly and covering nearly 2,000 substances, the new edition explains whether each drug is FDA-approved for use by expecting or nursing mothers...is known to be safe for use...or is known to pose a danger. An alphabetical organization by both trade and generic name...a special index listing drugs by category...and an easy-to-read page format make reference more efficient. As an Expert Consult title, it now includes fully searchable convenient online access to the complete contents of the book at www.expertconsult.com. Describes each substance's mechanism of action, side effects, drug-drug interactions, dosage, cost of therapy, and degree of safety during pregnancy or lactation, providing the thorough details you need to choose the most effective course of treatment. Includes over-the-counter drugs and alternative medications as well as prescription drugs, to give you a broad background of available drugs. Features an alphabetical organization by both trade and generic name...a special index listing drugs by category...and an easy-to-read page format that make reference more efficient. Uses an eye-catching icon to highlight known teratogens.